not to hi-jack this thread, but I'm pretty close to done... figure it out a small profile angle connector for power and waiting on the belkin bluetooth. after that, I have to send all the parts to Eric for painting all black. So any news from Fabspeed? Did you get the X51 kit installed? Are you doing the install? If not, will you really have to pay for 50 hours? One guy working full time solely on only you car for over 6 days? I didn't get the whole X51 kit. Just got the X51 air box, maxspeed motorsports 84mm plenum and X51 throttle body. I did the install myself. Oh someone bought the whole kit this fall and I was wondering if it was you. i Just bought and installed the exact twins, I got them from the UK. I found that the innards of the carbon fiber were a bit rough, I expected it to be smoother. I did a little sanding before I installed it though. What did you do with the vacuum switch that was on the stock intake? I was referring to the dual COLD air intake, Alex any updates? Any performance improvement? As that design will let warm air get to the filters as it's not a CAI design like the stock intake box. Noticeable performance - no. Sound improvement yes. Aesthetic engine bay - yes. Looks and sounds great. I'm not too worried about sucking in engine compartment temperature air. A snorkel is included that attaches to the lid to help get cold air to one of the filter cones. I actually saw an improvement in mpg. ^same, I'm interested because unlike the 3000k X51 this looks like its under $600 US and might sound and perform decently well. Certainly looks good. I ended paying about $541 with shipping. Hey guys, sorry for the delay. I just wanted to give you an update on the intake that Fabspeed has in the pipeline for 2013. 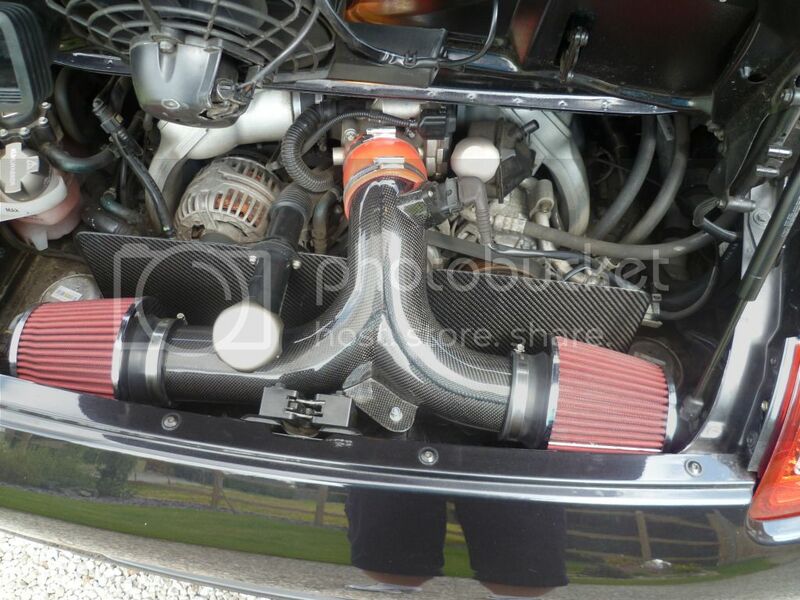 Our current J Pipe Intake does work better compared to the stock airbox in terms of intake sound and power. But as Chris said, we wanted to address a few things that our customers brought up to us over time and also improve the design. We redesigned it for more power by increasing air flow but also reducing heat from entering the intake location. So here is a few prototype photos of our new Y Pipe Competition air intake design that we have been working on for the 996 and 997.1 cars. This prototype is not a finished piece so it is missing some components and does not include some of the additional parts. We have been designing and testing this new intake for a few weeks now and the results are looking good, so were hoping to release the new intake sometime in the next month or so. The 3.6 and especially the 3.8 liter engines needed improved air flow so making a dual inlet intake like the 997.2 and GT3 was only necessary. We improved the fit and angle of the Y Pipe approach into the throttle body which will help for smoother air flow and less restriction into the engine. The Y pipe was improved for smoother and increased airflow merging. We will also be Dyno testing a few different size air filters to see how the HP/TQ curve changes and also logging intake temperatures to see the improvements. We redesigned the Heat shield as well which is about 25% larger overall which helps keep the hot engine air from getting to the air filters. We will also offer an optional add on kit for the Top and side of the heat shield to enclose the intake even more from hot air entering the intake compartment and allow the air filters to only breath from the snorkels on the trunk lid. We will release more data and pictures as its tested and completed. We really look forward to the release of this new intake and showing everyone the benefits of the new design. We are starting to take pre-orders for the new intake so let me know if your interested. PM or email me if you have any questions at all.